My trip back to Hull, where I once spent a year at uni, got me thinking about all the different counties I've lived in. Turns out I've lived in nine of them. I did some calculations to tot up what percentage of my life I've spent in each county, and I came up with this ordered list. I've got around, haven't I? Top of the list is the county of my birth, then the four different counties I've had jobs in, then the two counties where I went to university, and finally two counties representing a messy relationship. If I can hang around in the capital until Easter 2022 then London will finally overtake Hertfordshire. I wondered whether nine counties might be rather a lot. ...and this is my Dad's. So I wondered what your list would be. Can you work your life out? n.b. List the counties you've lived in, longest duration first. n.b. Percentages please, not years. n.b. It's probably best to round things to the nearest whole number. n.b. Percentages may not add to 100% due to rounding. n.b. 'Lived in' means your main home base. Holidays, hotels and brief stopovers are not included. n.b. I used a spreadsheet to allocate the 631 months of my life so far. But feel free to be more approximate. n.b. If your life's been particularly globetrotting you may want to list countries rather than counties. n.b. Please spare us your life history. Last week Old Flo returned to Tower Hamlets. 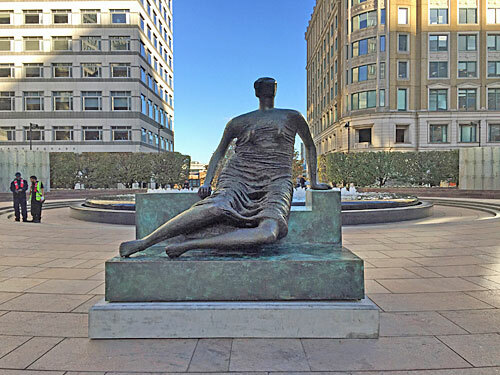 Old Flo is in fact Draped Seated Woman, a bronze sculpture created by Henry Moore in 1957. 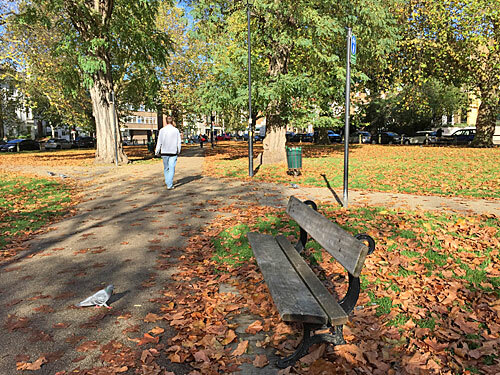 London County Council purchased her direct from the artist in 1962, at a cost of £7000, with the intention that she take up a prominent position on the Stifford Estate in Stepney. 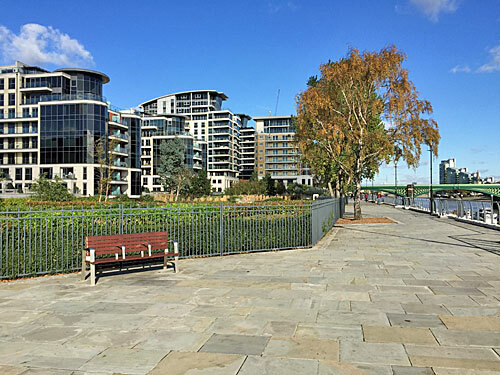 Old Flo was positioned close to one of three new 17-storey tower blocks, enhancing the neighbourhood through art, at least for those residents who liked her modern profile. And here she remained until 1997 when the estate was to be entirely redeveloped, at which point Old Flo was shipped out of the borough to the Yorkshire Sculpture Park. The story then jumps to 2012, when the Mayor of Tower Hamlets decided to sell off Old Flo at Christie's to raise funds for the cash-strapped council. But his decision was promptly questioned in the courts, with arguments hingeing around which body gained custody of the statue when the LCC was wound up in 1965. By the time ownership had finally been settled Lutfur Rahman had been discredited as Mayor, and the intended sale thankfully never took place. Incoming Mayor John Biggs then decided to bring Old Flo back, but to Canary Wharf where her security could be assured. She's now in Cabot Square, a raised piazza with a plush fountain and several other modern sculptures to boot, including a similarly robust bronze of an odd-headed couple by Lynn Chadwick. Old Flo looks very much at home, and you can see her here at any time. But what you may not have known is that you could have seen her elsewhere in London for several years before she came back from Yorkshire if you'd known where to look. Here she is, and here she has been, over in Pimlico. Henry Moore made a total of seven casts of Draped Seated Woman across the period 1958–63. He gave his own personal copy to his daughter, who sold it to a private collector, who in 1989 lent it to the Tate on long term loan. 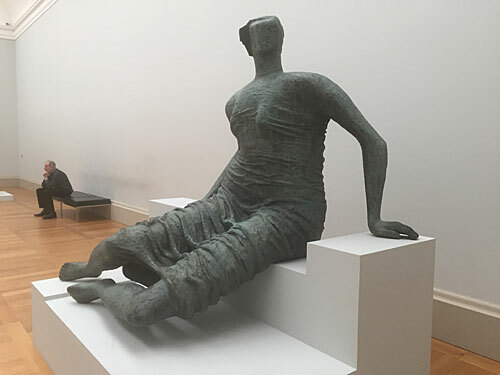 It's currently on display in the Henry Moore Room at Tate Britain, alongside other sculptural classics like Recumbent Figure and Family Group. Four of the other casts are in museums in Melbourne, Jerusalem, Brussels and Connecticut, and the other can be seen outside a public swimming pool at Wuppertal in Germany. Meanwhile, back in Stepney, no public art is on show. 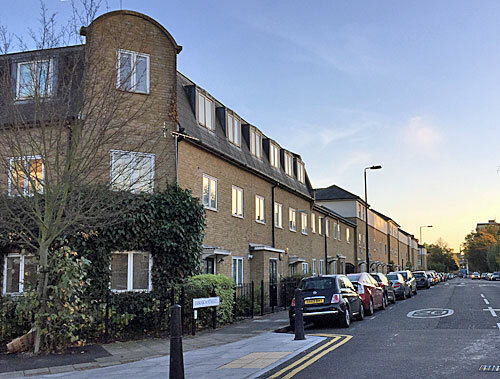 The Stifford Estate was rebuilt at the start of the century in typically Tower Hamlets style - partly flats but mostly three-storey townhouses, back when these were still deemed to be a good use of land. It's not a well-off corner of town but by no means shabby, and home to many a family from the squeezed middle and below. Rows of cars now fill the front gardens of Ewhurst Close, the cul-de-sac on the land where Old Flo once sat, with small private gardens out back leaving no communal space for anything in bronze. 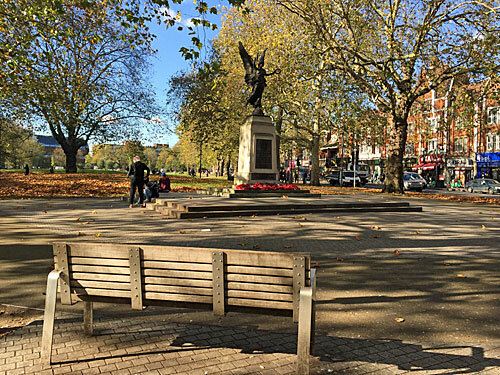 In happier times Old Flo might have been resited to Stepney Green Park, the large grassy expanse immediately adjacent to the former estate, where the local population might once again have enjoyed seeing her, sitting on her and probably jumping off her too. But leaving expensive chunks of metal unguarded in public places is now deemed far too risky, hence Old Flo's move to a bankers' piazza watched over by 24-hour security and CCTV. Henry Moore would have been disappointed by his sculpture's upmarket shift, but at least she's back in the borough where we can all make her acquaintance once again. Here are crossword-style clues to 24 birds with seven-letter names. A reminder that you can follow this blog on Twitter at @diamondgzrblog. It auto-tweets a few minutes after I post something new, which is usually (but not always) around seven in the morning. It only tweets once per post, and it never tweets about anything else, so it won't clog your timeline. Why not join @diamondgzrblog's 379 current followers, especially if you're a bit forgetful, or if you'd like to be alerted every time I post something extra at an atypical time? Obviously today has been a bit annoying for those 379 followers because they've seen a tweet linking through to a post encouraging them to follow an account they already follow, which is 100% pointless. But if I promise never to do this again, then it won't happen to you. Yesterday looked like being a nice day so I decided to head out for a long walk. But where? I dug into the shoebox where I keep the leaflets for walks within easy reach of London I haven't done yet, and skimmed through. 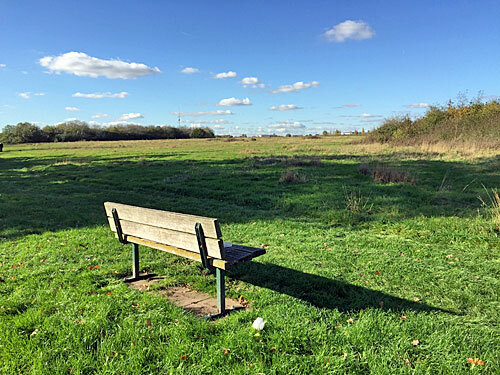 The rest of the Thames Estuary Path, perhaps, Broxbourne National Nature Reserve, Colne Valley Park, walks around Lewes, walks around Wallingford, the Kennet and Avon Canal, the Alban Way, the Worth Way, the Cuckoo Trail? 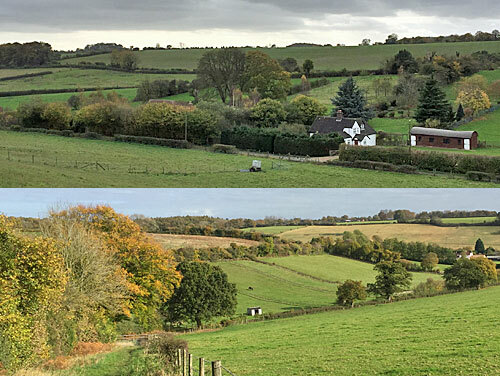 But it felt like a Chilterns kind of day, thanks to the changing of the seasons, so I settled on a Chesham walk instead. 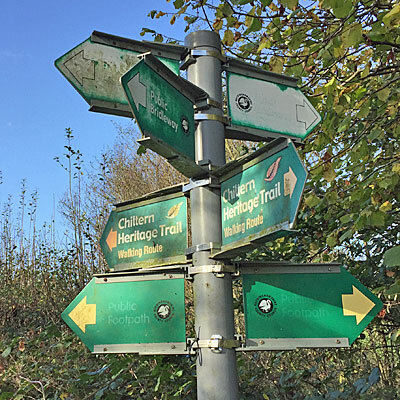 Chesham Town Council came up with six walking routes in 2008, with a leaflet for each, and have subsequently knocked out four more. They range in length from 2-mile-urban to 8½-mile-trek and are wonderfully thought-through, fully showcasing the wonderful scenery around the town. I think it's possible to pick the leaflets up for free from the library or Town Hall, but I couldn't check that on a Sunday. It's definitely possible to download them all from the council website, here, should you ever be interested in a chalky walk it's dead easy to reach from London. Catch the Metropolitan line from Baker Street and you could be striding out into the countryside within the hour. 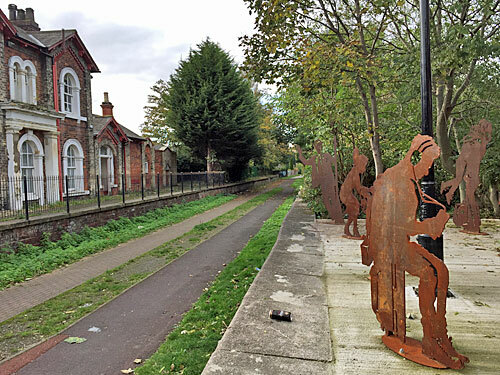 I chose walk 2 - The Chesham Outer Ring - a 7½ mile circuit around the northern fringes of the town. Most of the route is across or alongside fields, and it feels proper rural throughout, although you're never too far from civilisation if you want to cut things short. Three pubs are passed, if that's your thing. There's a lot of up and down, crossing narrow dry valleys, but nothing too taxing. Thankfully it hasn't rained much of late, but I imagine it gets quite squelchy underfoot during British Winter Time, so come prepared. I had a lovely three-hour circumnavigation, without ever getting lost, and mostly unencumbered by other walkers. When the sun finally came out the autumn colours were splendid. I've decided not to write about the walk in depth, because the chances of you following in my footsteps are remote. But if I had written it up, the following five sentences would all have appeared, except in separate paragraphs rather than bundled together incoherently into one. The cowpat in the kissing gate, spotted fractionally too late, was a particularly unpleasant discovery. D.H. Lawrence lived in Bellingdon Farm Cottages for four months at the end of 1914. Several groups of backpacked teens, seemingly on some trekking challenge far from their multicultural homes, congregated on verges attempting to work out where to head next. The wonderfully named Bottom Lane descended into a leafy tunnel of overhanging potholed gloom. Departing the field where three alpacas were running free, I stepped past a single oak tree to see the whole of Chesham arrayed below. The tentacles of Hull, City of Culture, spread up to and beyond the city boundary. One of the City of Culture's major communal strands has been the story of the Land of Green Ginger, a mysterious underground land populated by tiny people, or so the story goes. Ever since some magic crates were discovered back in April heralding a mass gathering in the local park, a series of Acts Of Wanton Wonder have taken place across the suburbs, drawing families into a complex fictional world. 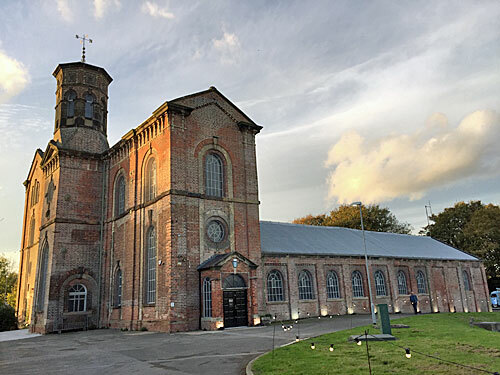 The latest chapter began when an unexpected light was seen on top of Springhead Pumping Station, an old Victorian building still used by Yorkshire Water. For two weeks everyone's invited up the lamplit path to investigate further, and marvel, and thousands have already been inside. 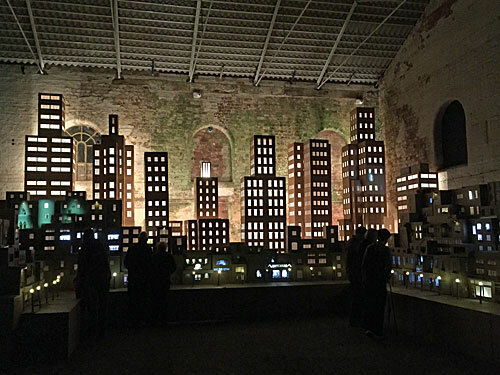 In the main room a sprawling cityscape has been built out of what's probably cardboard, with a dozen tower blocks rising at the back, their windows individually illuminated. A man in his underpants is dangling from one, while other lower windows reveal gymming dancers, angry pensioners and butchers sharpening rather large knives. 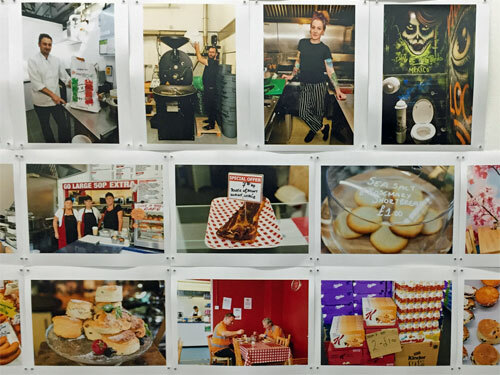 Surely nobody would buy a meaty meal from Fat Rat Burgers or Rolling Rat Kebab, and just what might be going on behind the cinema's closed doors? If this surreal mash-up of model village, murder and looping projected infill were on show in London you'd never have heard the end of it. Your loss is Hull's children's gain. The Brynmor Jones Library is best known for its former librarian, the poet Philip Larkin. I missed him by a year, and haven't been back since 1987 when I used to scan the shelves to aid some postgrad assignment. I almost remembered which way to go to find the place, not helped by the fact that the Art Deco styled block with its brutalist 1969 extension has been very recently re-extended with a new building out front. A banner above the doorway, aimed at next September's intake, urges them to 'Step into your bright future'. I stepped through into very much my distant past. 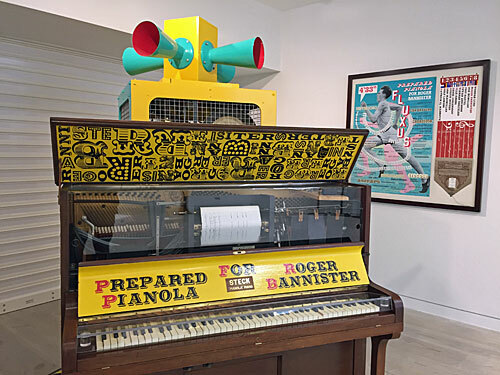 The library includes a new gallery to showcase the university's considerable art-hoard, which this month is hosting a selection of the more humorous items from the Government Art Collection. Some 18th century cartoons remind us that political satire is nothing new, but the majority of the display is considerably more modern; some Martin Creed neon, a Grayson Perry battlescape, bronze 'polystyrene' cups, even a large frame filled with a reproduction of the floral grille on a Safeway Alpine Garden Gel Air Freshener. I wish this kind of stuff had come visiting when I was studying here. "And if you head across to the far wall beyond the reception desk," urged the volunteer, "there are some abstract photographs based on interviews with dyslexic people." Indeed there were, but I used the art simply as an excuse to cross the lobby past study desks, book drops and a bank of photocopiers, a pretence to mingle with a generation of students I was no longer part of. What I remembered as a temple to books was now a conduit for streamed information, suggesting either I passed through when study was really simple, or conversely when the skills needed to learn anything were conspicuously hard. I walked out of my alma mater feeling chastened and irrelevantly anachronistic. There used to be a station on the Beverley Road called Stepney. It closed to passengers in 1964, although the track is now a cycleway and the former station building has been subdivided into flats. For Hull 2017 ten lifesize metal sculptures of potential staff and passengers have been embedded in the stumpy remains of what's left of the platform. The installation didn't detain me long, but I thought I'd best mention it because some readers get desolate if I keep blogging for days about things that aren't railways. Eight miles north of Hull lies Beverley, a very different kettle of fish. 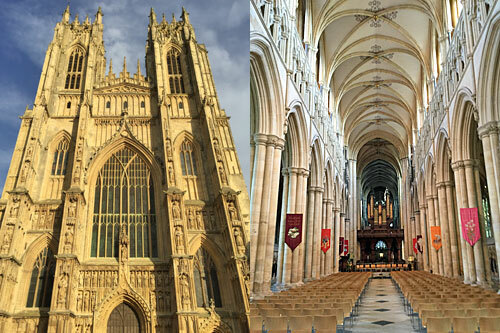 Beverley is a proper Yorkshire jewel, the county town of the East Riding, and retains a twisty historic high street leading to a part-time market square. Its museum and art gallery have transferred to a building that's anything but quaint, the so-called Treasure House, a modern brick hub on a corner site with a cylindrical sightseeing tower. 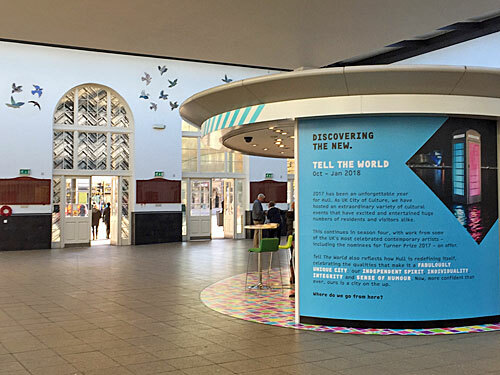 For the very latest City of Culture exhibit head through the upstairs gallery, past the world's largest cattle painting, to find an amazing digital mural. 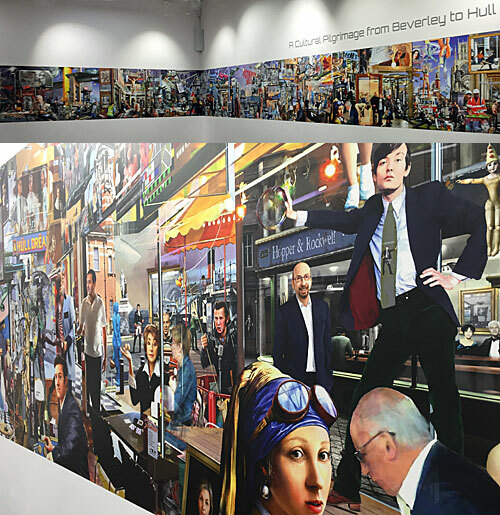 The panels of this 'dreamscape' stretch for over 20 metres round the gallery walls, taking the viewer on a notional journey from Beverley at one end to Hull at the other. Everywhere inbetween appears to have been skipped over, however. 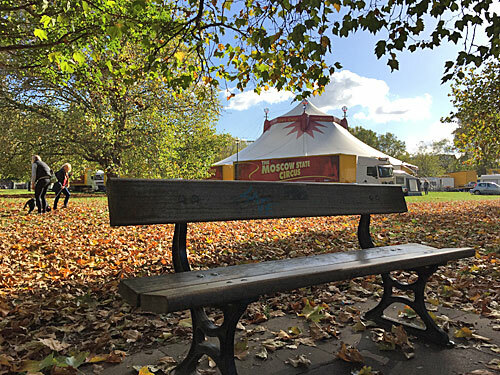 In addition to well-known buildings from the two towns, over 200 people have been crammed in throughout, from actual local-born souls like Maureen Lipman (she's playing cards) to interlopers like Stephen Hawking (he's sat in a dodgem car) and Stephen Fry (he's on a throne with Sooty). It's surreal but brilliant, and merits careful scrutiny throughout as you try to deduce who's who, what's what, and where the artist's warped humour might have come from. Non-visitors can pore over several of the individual panels here. 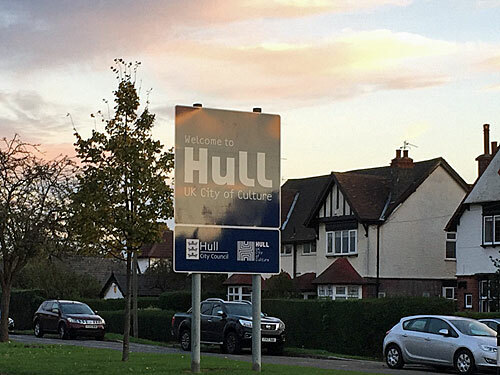 As a former resident of Hull, I had to go back in 2017 to experience its year in the spotlight as the UK's City of Culture. I'm pleased to report that Hull did not disappoint. Here are seven events from the arts programme on show right now. Passengers arriving at Hull's imposing terminus this year are greeted by flapping banners, jolly posters and a flock of colourful birds. The birds are part of an artwork remembering the station's role in six decades of 'transmigration', the flow of human traffic from mainland Europe to the New World. Millions of people arrived in Hull by boat, caught trains across to Liverpool or Southampton and then sailed on to a new life in America, until WW1 brought this human flow to an abrupt halt. Many of the migrants carried their belongings in woven baskets, hence that theme's splashed across the windows too. This entrance space is also where to find the City of Culture pop-up booth, staffed throughout the day by advice-wielding volunteers. The most useful thing I was given was a sheet of A4 paper listing just the events taking place on the day of my visit, which helped enormously in unpacking the 72-page catalogue for what to see. Far too much to see in one day, obviously, but I gave it a damned good try. 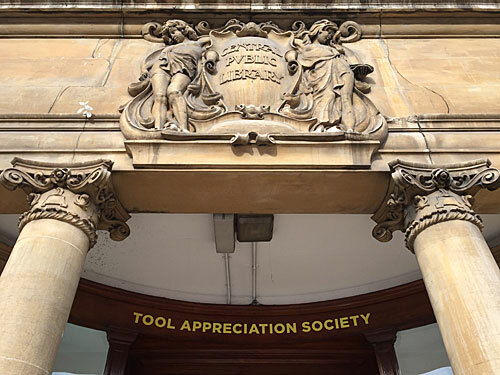 The Tool Appreciation Society sounded like a brilliant take on overlooked history, the contribution of skilled craftspeople to the making of society. 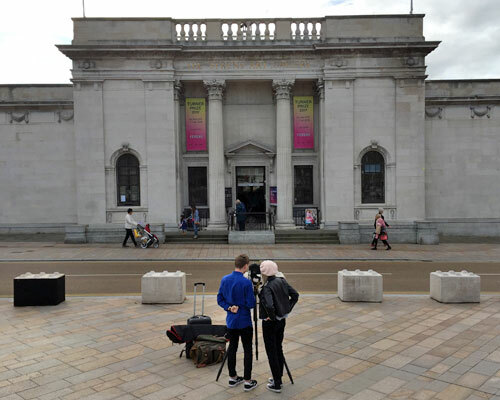 Artist Linda Brothwell has been out meeting local veterans like Walter Oglesby and Eva Crackles, as well as assembling four collections of traditional tools to work on especially modern projects, such as the replacement of missing letters outside a Liverpool cinema. I found the exhibition inside Hull Central Library beyond the staircase beyond the cafe. The most enthusiastic volunteer I've ever met greeted me and showed me all the stuff there was to see in his downstairs room, pointing out what was on the walls, explaining every stack of paper on the table, handing me a newsletter, offering me a sticker, inviting me to leave feedback, then finding more words on the wall he hadn't pointed out before. Upstairs in the Edwardian reading room, by contrast, the volunteer on duty merely clicked his clicker once to register my presence then totally ignored me while I spent not very long reviewing Linda's toolset and longer admiring bookcases and the wood-panelled walls. Hull Minster, England's largest parish church, has a slightly less large piazza out front, generally empty. We'll fill that, said Chile-based architects Pezo von Ellrichshausen and Swiss artist Felice Varini, who've arranged 16 large galvanized steel columns in a grid formation in front. Their stated aim was "to highlight the symmetry of the church's facade", although it's currently despoiled by scaffolding so that didn't quite work. 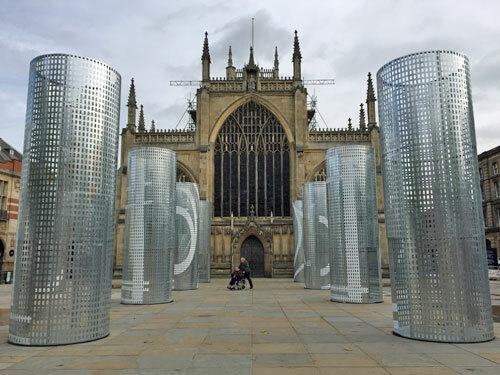 Apparently "visitors to the installation will be able to inhabit each of the six-metre-high columns", or in other words step inside, "and experience varying light conditions created by perforations in the steel skin", this mainly because the weather changes. Previous sculptures in the Look Up series, such as the windfarm blade poised above City Square, have had rather more impact. For those in search of 'proper' art, Hull's maritime museum has borrowed four canvases by the watercolour master JMW Turner. His whaling quartet was originally displayed at the Royal Academy and captures the offshore industry at its peak, with somewhat fuzzy ships and bloody blurs for carcasses. The people of Hull thank NPS Group for their sponsorship of this exhibition. The last time I visited Hull the Fruit Market area was in transition, a dilapidated collection of warehouses close to the Humber's murky banks. Today it's a swanky street of bars, galleries and boutiques which wouldn't be out of place in Hackney, except that the far end hasn't quite risen yet, and the coffee is cheaper. As I followed a trio of blondes tottering down the cobbles past a chocolatier and micro-distillery, I wondered what on earth had happened to the city I once remembered. 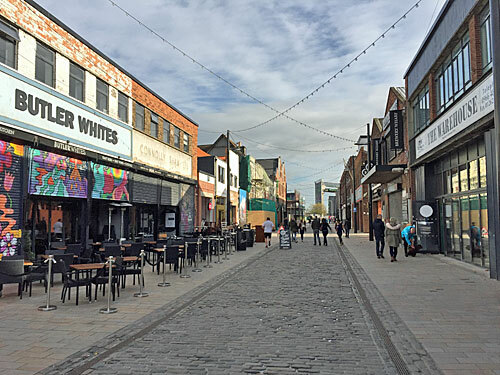 At the heart of this new gentrified zone is the Humber Street Gallery, a four storey warehouse tastefully converted into exhibition floors with a cafe on the ground floor and a rooftop bar on top. It also put on the two art exhibitions this year which have most made me smile, so well done them. Photographic exhibitions can be dull, but not this pair, laid out inside the Humber Street Gallery on separate floors. Upstairs are Olivia Arthur's portraits of the youth of Hull, uncompromisingly snapped in black and white poses reflecting their hobbies and interests. Two footballing teens, a girl with a snake hanging from her neck, an Elvis impersonator, a suckling Mum, a space geek, a skateboarder, etc. etc. Blimey, I thought, closely inspecting one of the prints, that young lad really does have 'Destiney' tattooed on his neck. To celebrate the 50th anniversary of the Calvert and Kinneir road sign, leading artists and designers were invited to come up with a brand new circle, triangle or square. Sir Peter Blake came up with several. 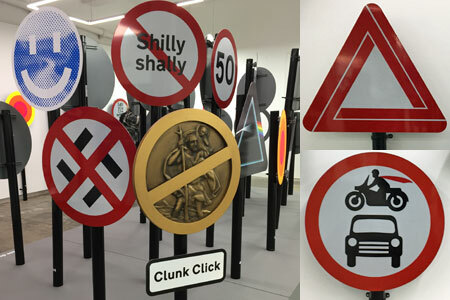 I loved the wit and verve of the 58 signs in the gallery, especially those with a simplistic thrust or a pertinent point to make. A warning sign based on an impossible triangle. A mini roundabout in three concentric circles. A Beatles sign with arrow pointing up paired with a Stones sign with arrow pointing down. Give Way to investment in health, education and renewables. Nazis prohibited. Love cycling. No shilly-shallying on the way. As great ideas for public art go, try this. 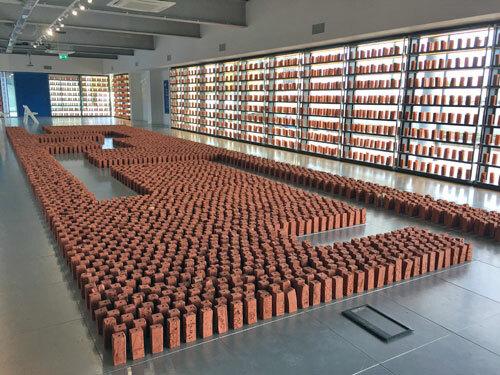 The City of Culture team approached every early years setting in the city, provided clay, and invited every child under five to decorate a brick. All these bricks were then fired, and positioned (upended) in a geometric pattern across the floor of a new business hub located by the mouth of the river Hull. This collective assembly represents the youngest members of Hull's population, and has given them an early taste of the potential of creativity. It looks great. All's quiet now, but when the schools break up next week the volunteers expect a rush of families coming to see what their littluns have been doing. Then once half term's wrapped up every child has the right to take their own brick home... although they're not catalogued, nor in order, so I doubt that plan is in any way practical. A truly striking reminder, however, that Hull's next generation is very much on its way. The Turner Prize is awarded annually to a practising British artist, and is worth £25000 to the winner. This year for the first time there's no upper age limit, and two over-50s are included on the shortlist of four. 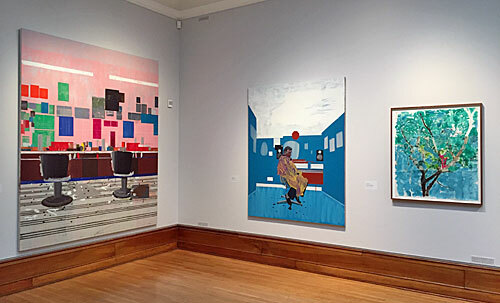 In alternate years the Turner Prize exhibition is held in a gallery outside London, and this year it's at the Ferens Art Gallery in Hull, the UK's City of Culture 2017. Entrance is free (which isn't generally the case when it's in London). The Ferens Art Gallery was opened in 1927. It's named after (and was paid for) by Hull businessman Thomas Ferens, whose company Reckitt & Sons made its money manufacturing household products including Brasso, Windolene, Dettol and Reckitt's Blue. The building is a mostly one-storey affair, in classical style, and owns an acclaimed provincial art collection. The Ferens was recently closed for two years to enable a £5m makeover in readiness for its Turner Prize presentation. It's a cracking gallery. 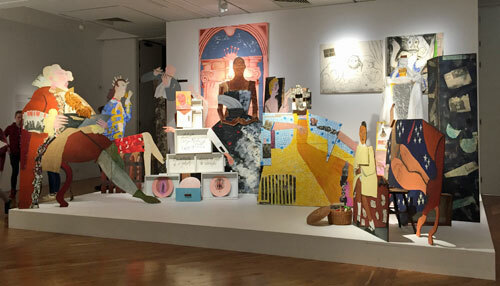 Lubaina is the oldest of this year's finalists, hence the centrepiece of her display was created back in the 1980s, an angry Hogarthian collection of lifesize cutouts depicting Thatcherite London. I much preferred her 100-piece Lancaster Dinner Service, a recontextualised crockery set overpainted with characters from the British slave trade, including obese red-coated gentleman on willow pattern and nobler black profiles on a tureen. This jolted my uneasy Empire sensibilities - her censored collage of Guardian news and sports pages somewhat less so. The volunteers in attendance, in their blue City of Culture jackets, make a refreshing change to the unresponsive attendants usually found in galleries. These Hull citizens are keen to nip in and engage, to say hello or to ask a little more, with a smile and without being overly intrusive. It's almost like they can't believe a quartet of nationally-important works has ended up in their backyard, and their enthusiasm is infectious. Hurvin paints, simply paints, which in the repertoire of the Turner Prize verges on an original choice of medium. His canvases are big and bright and frequently reflect his family's Caribbean background, as for example with a parrot outshining the canopy of a tropical tree. A recurring motif in his works is the barber's chair, often empty or with its inhabitant anonymously facing the other way. The volunteer who strode up to me in this room had a fairly firm opinion that Hurvin should win the Turner. This is the one our visitors seem to like best, he said (those visitors on yesterday's evidence being mostly the retired of the East Riding and beyond). A lot of the other rooms contain more experimental stuff whereas this is proper painting - I'm paraphrasing what he said, but I suspect most of those he strides up to agree. German-born Andrea works in a variety of media, and her woodcuts are prominently positioned in this year's Turner display. 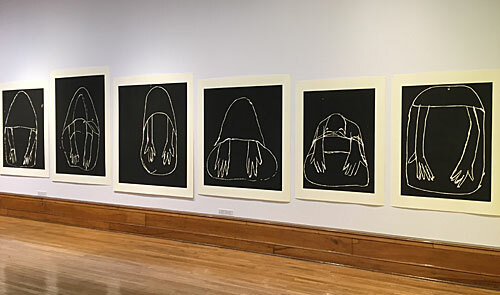 A row of eight, in stark black and white, depict what look like hastily-drawn handbags with arms outstretched, but which take on a deeper meaning when the title of the work reveals them to be beggars. A separate scrapeboard-style work entitled Duck and Daisy (more duck than daisy) exhibits a somewhat cartoonish take. More involving are Andrea's photoboards illuminating the words of Simone Weil, a French philosopher whose descriptions of the rise of 30s fascism plainly resonate today. I don't know if you've spotted it, said the lovely lady overseeing this room, but there's a spelling mistake over there. Her intervention inspired me to read every word on the Simone Weil boards, but I still missed the glaring error even though it was in a title. Did you see it, asked the attendant half an hour later, now patrolling in a different room - Uprootedness spelt with only one 'o'? Maybe this was art, but more likely transcriptional carelessness, and if Andrea wins the £25000 I may wince. Last year's Turner winner was a filmmaker, and Rosalind is screening two. The first is Electrical Gaza, an eye-opening documentary showing daily life inside this hard-to-enter enclave. 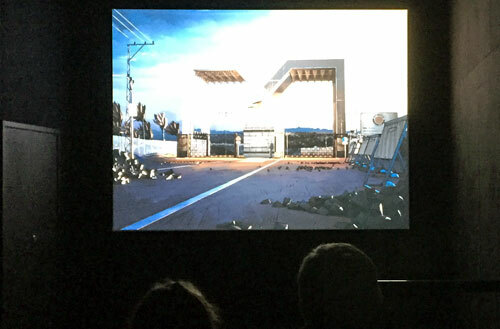 We see mostly men and boys, singing, selling fish, lounging in alleyways, washing horses in the sea or crowding at the border gate, the action occasionally slipping into animation. In Vivians Garden a mother and daughter in Guatemala do nothing much but chat, pick clothes and create their own art, in an unfamiliar but disjoint slice of life. Both films are illuminating, especially to an international audience, but perhaps too National Geographic to be worthy of a win. A pair of grey-haired blue-jacketed ushers waited on duty outside each temporary screen. You know there are two cinemas, this one's 20 minutes and the other's 30, mind the curtains, there are seats on the left-hand side. Neither of the pairings knew whether they were the first to greet you or the second. You know there are two cinemas, this one's 30 minutes and the other's 20, mind the curtains, there are vacant seats up at the back. London's art crowd should to head to the provinces more often, it's a lot friendlier out here. The winning artist will be announced on 5th December. It'll be Hurvin or Lubaina (unless it isn't). Yesterday the company Bloomberg, who undertake all kinds of financial activities, opened a brand new office block in the heart of the City. 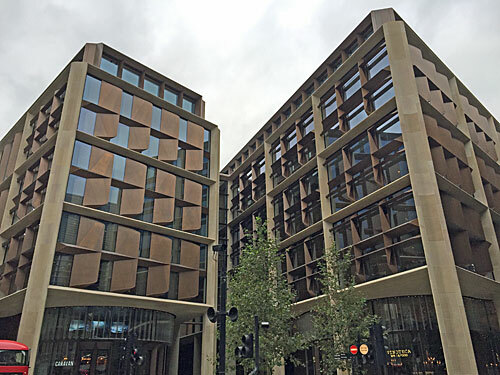 Their European HQ is a nine-storey groundscraper, sprawled across a three acre block between Bank and Cannon Street stations, and divided in two by a central pedestrian thoroughfare. 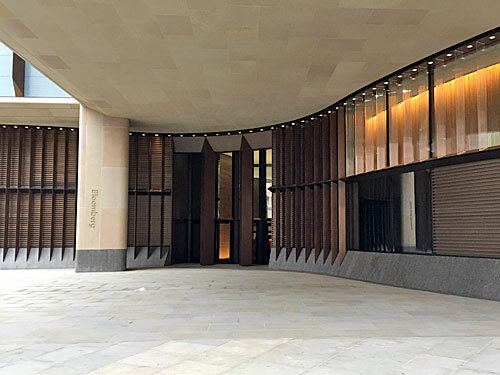 The upper levels are clad in Derbyshire sandstone with bronze fins for ventilation, while at ground level a wavy colonnade is occasionally punctuated by secure entrances, fire exits and restaurants. 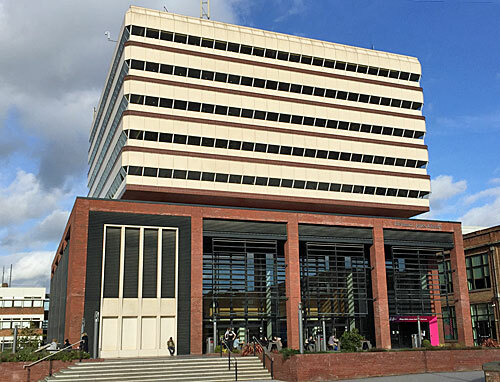 The building covers the site of Bucklersbury House, one of the first postwar slab office blocks, which was five storeys higher and has not been greatly mourned. The design is by Foster + Partners, and the overall cost is thought to be £1 billion. Bloomberg's new City headquarters claims to be the greenest large office building on the planet, with a record-breaking 98.5% BREEAM rating for its environmental impact. The deep plan interior spaces are naturally ventilated through a ‘breathing’ façade, a top-lit atrium enhances internal illumination, and smart CO2-sensing controls divert airflow to the most populous corners of the building. Less brilliantly, the lift cores have been positioned around the edge of the building so the exterior has a somewhat fortress-like feel at ground level. Most of the critics who've been inside have waxed lyrical about the architecture, including a hypertrichoid staircase vortex and integrated LED ceilings, but you won't be seeing any of that unless you're an employee of this particular company. 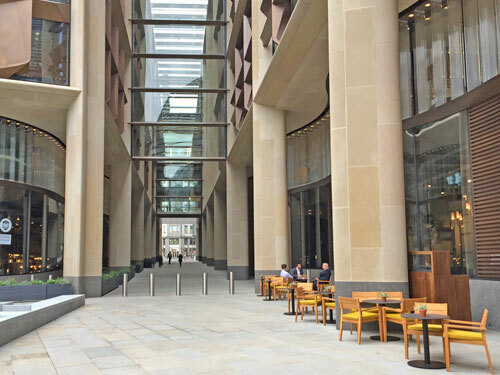 The exterior walkway which bisects the Bloomberg office space follows the approximate line of Watling Street, and has been grandly titled Bloomberg Arcade. Pedestrians may enter at each end and follow the paved alley beneath a linking bridge, while vehicles are kept at bay by rows of pert metal bollards. Unlike the former Roman road this passageway is privately owned, part of the creeping advance of pseudo-public realm within the City's Ring of Steel. 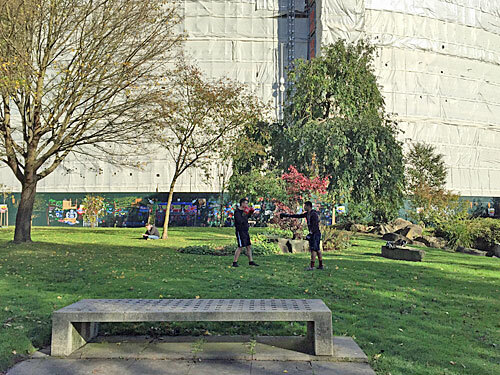 Security guards tour the exterior of the building to scrutinise passers-through, while CCTV keeps watch should potential hoi-polloi consider breaking any of the space's unlisted regulations. Bucklersbury House never had a central passageway, so technically this is an enhancement of accessible connectivity, but undesirables should expect to be moved on. The Bloomberg Arcade is home to a collection of curated restaurant brands which have got London's on-trend foodies immensely excited. Caravan are here with their casual all-day dining concept, serving brunch-type fusion dishes including squash and Stilton pizza. Vinoteca are here offering buzzy British-Euro eats to clustered punters on an outdoor terrace. Homeslice are here, maintaining culinary integrity with signature 20” pizzas and seasonal cocktails. 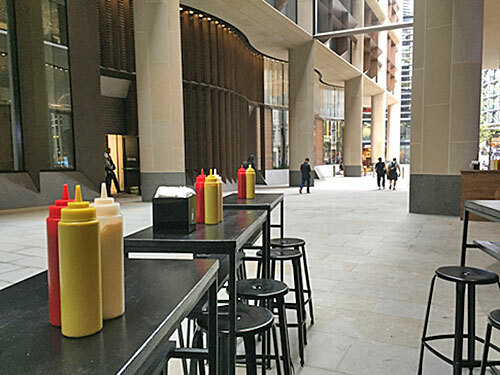 Bleecker are here, with squirty ketchup bottles poised to douse serious New York-style burgers. Restaurants coming soon include Koya Bar, Ahi Poke, La Tristesse, Brigadiers and Michelin-starred A. Wong, one of which I made up to prove how little you know about what passes as acceptable food these days. 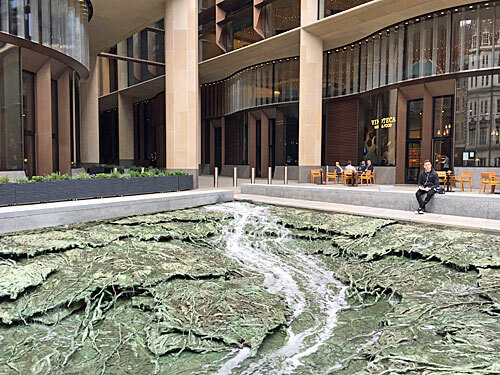 The City's lost river, the Walbrook, once flowed across the Bloomberg site. Long buried, its former existence has been celebrated in a new public sculpture by the Spanish artist Cristina Iglesias. She's devised an unlikely pair of bronze pools, called Flowing Streams, at either end of the central arcade. Gnarled metal roots thread across a depression of layered 'earth', across which water trickles and occasionally pulses, evoking an unlikely wooded pre-Londinium landscape. As low-level fountains go, it's highly attractive. Sit back on the granite surround with your sandwich, or hand-twisted spinach wrap, and reflect on a lost river dramatically unearthed. When TfL first proposed closing every station ticket office, four years ago, there was a furore. Unions went on strike, newspapers screamed, and passengers got very upset. But when TfL finally got round to closing the last ticket office, two years later, nobody batted an eyelid. Unions rolled over, newspapers overlooked the event, and passengers carried on swiping cards through gates as usual. So it may come as a surprise to hear that TfL are currently closing the ticket offices at 11 tube stations, because they didn't get round to closing them before. Two of these stations are on the Richmond branch of the District line, and the other nine are at the northern end of the Bakerloo line. What they have in common, you may have noticed, is that these stations also serve the London Overground, with tube and Overground trains sharing the same tracks. TfL would have liked to have closed the ticket offices at these 11 stations in 2015 but they weren't allowed. Before the Overground began they'd been operated under different terms and conditions, which included the requirement to be able to sell tickets to National Rail stations nationwide. Closing these ticket offices therefore required a separate public consultation, undertaken in conjunction with London TravelWatch, and this (and a change of Mayor) delayed the process considerably. But TfL are now going full steam ahead. Everything is explained in the 'Improvements and projects' section of their website, specifically a page called 'Bakerloo/District line ticketing'. From 14 June until October 2017 we will be installing new ticket machines at 11 stations on the Bakerloo and District lines. Ticket offices at most of those stations will then close. These are special ticket machines, slimmer and shinier than the usual ticket machines seen on the tube, and with enhanced capabilities. These machines can sell you a ticket to Leicester, not just Leicester Square, or an advance return from Dundee to Plymouth if that's what you need. Staff will be available to help customers buy tickets. Installing new ticket machines is part of our efforts to improve the Tube. Closing ticket offices across the Tube network means we have been able to move our staff into ticket halls where they can help our customers more effectively. At the two District line stations the ticket offices have already closed, way back on July 5th. I travelled down to Gunnersbury station to see what's transpired. A member of staff was stood in front of the former ticket window, poised to offer help. She wouldn't have been stood there previously. Another member of staff was sat inside, clearly visible through the glass, doing staff-ly things on a terminal. Where the sign above the window would have said Assistance and tickets it now said Assistance. 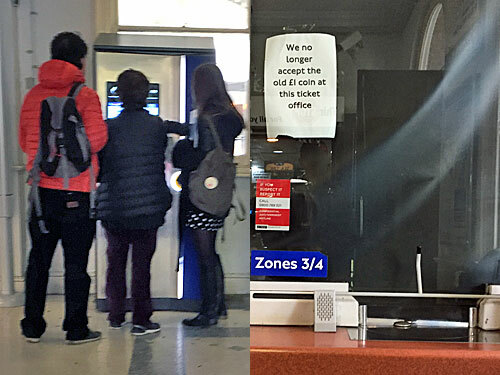 A sheet of paper stuck to the window said "We no longer accept the old £1 coin at this ticket office", even though it was no longer a ticket office. One stop down the line at Kew Gardens the shutters at the ticket window were firmly down. One member of staff was patrolling the ticket hall, and another stood beside the adjacent gateline. The same notice about old £1 coins was still stuck to the glass. A second more amateur notice alongside advised passengers that the window was now for Information and Assistance Only. Ticket Office Closed. Please Use Ticket Machines. Two new slimline ticket machines had been installed, and one was being used by a cluster of passengers. So far, so New Normal. But it's a different story so far on the Bakerloo line, where closure hasn't yet taken place. At these six stations, the ticket office is seemingly still open for two hours in the morning peak and two hours in the evening peak. I didn't manage to visit any of them during the four hours the ticket office is supposed to be operational, but the signs above the windows still said Assistance and tickets, and the Closed signs propped up in the windows looked temporary - between rush hours - rather than permanent. What seems to be holding things back is the installation of the new ticket machines. I spotted one at Kensal Green, along with three older machines, but none at Stonebridge Park, and none at Harlesden either. Harlesden's ticket hall is so tiny that it's hard to imagine how a new ticket machine could be squeezed in, other by knocking down the ticket office. Indeed it's hard to imagine that sufficient changes could be made in time to bring about closure by TfL's stated deadline of October 2017. At three other Bakerloo line stations, meanwhile, closure has been deliberately held back. At the other 3 stations, ticket offices will stay open while we monitor customer use of the new machines for 3 months. A decision will then be made about the ticket offices. 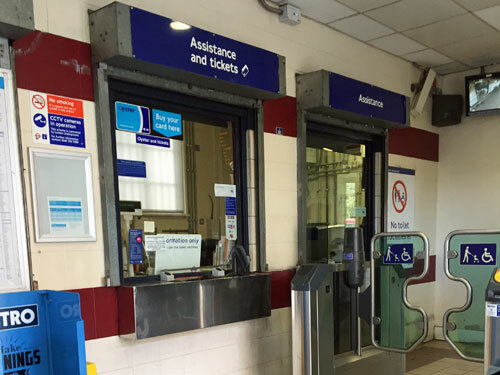 London TravelWatch proposed that the ticket offices at the three busiest stations - Harrow & Wealdstone, Wembley Central and Queen's Park - should remain open. At the very least, they said, run a trial for at least two months to see if the new machines have any effect on ticket office usage. We'll give it three months, said TfL, hence these three ticket offices are on borrowed time while the trial plays out. At Queen's Park, for example, one new ticket machine has been added alongside four older models. Meanwhile there are two ticket windows, not generally both in use. When I passed through I saw one customer at the ticket window, and another at one of the older ticket machines. It's not clear whether the requisite three month trial period is underway. Imagine if the same attention afforded to this Bakerloo trio had been applied to all the other tube station ticket offices across the network. Instead TfL just clodhoppered in and shut the lot, on a point of principle, without considering whether certain stations really ought to keep theirs. I find it amazing that Waterloo (100m annual passengers), London Bridge (71m) and Stratford (67m) no longer have TfL ticket offices, whereas Harrow & Wealdstone (5m), Wembley Central (6m) and Queen's Park (6m) might keep theirs. What's properly mysterious is that one intermediate Bakerloo line station has been completely missed out. For reasons I don't understand, but which someone might point out in the comments, Willesden Junction isn't included in the ticket office crackdown. What's more it actually has two ticket offices, one at the Old Oak Lane entrance and the other at the Harrow Road entrance, and as far as I know both of these are staying open. Willesden Junction may soon be a complete anomaly on the tube network - the only tube station served by only TfL services to retain a ticket office. Oxford Circus, 83m passengers, no ticket office. Willesden Junction, 5m passengers, two ticket offices. Ticket offices still operate at the vast majority of Overground stations across London, which are run to a completely different business model. Even a minor outpost like Hatch End (0.7m) boasts a ticket office that opens for 59 hours a week, while the ticket office at Highams Park (2m) opens for over 90. It's a right peculiar system which allows tiny South Hampstead (0.5m) to open up its ticket office at quarter past seven every weekday morning, while Green Park's (41m) will never open again. But plans are afoot to rid the Overground of its ticket offices too, thanks to these clever new ticket machines and their enhanced capabilities. TfL now plan to install them across the Overground network, not just at stations on the outer Bakerloo, and every Overground ticket office will then be closed. Subject to consultation, which may or may not throw up exceptions, total closure is proposed by the end of next year. Meanwhile there will always be a handful of tube stations with ticket offices, mostly on the District line, because they're run by National Rail. At the following seven tube stations rail services dominate, and tube trains generally just slip in up the side. Their ticket offices aren't always able to do Oystery things, but customers can still carry out an actual transaction with an actual person, in sharp contrast to what happens one station up the line. We live in a capital with two radically different philosophies on ticketing, depending on which kind of station you choose to travel from. The ticket offices at these peculiar hybrid stations prove the point rather well. We evidently don't need all the ticket offices at tube stations we once enjoyed, that point is well proven. But did we really have to lose all of the other 260 along the way? 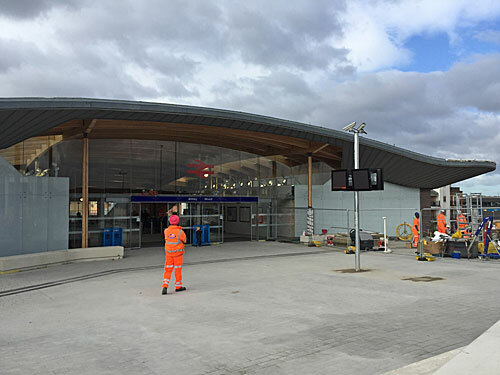 A brand new Crossrail station opened yesterday at Abbey Wood. 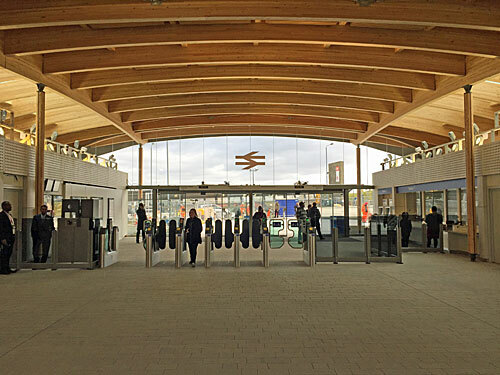 It's taken several years to tweak the station into its futuristic format, but the new two-storey ticket hall has arrived relatively swiftly. The most prominent internal feature is the framework of timber beams curving overhead, brightly illuminated by rows of spotlights, while outside it's the overhanging zinc roof which dominates. 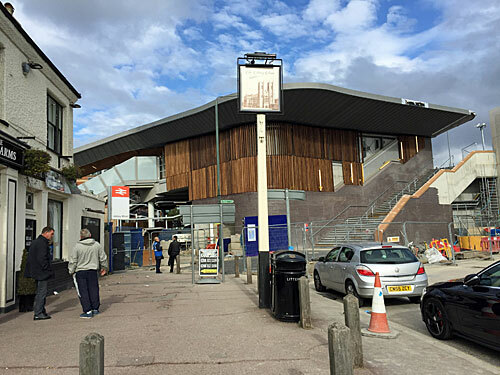 The key architectural challenge was to link the station both to the existing community at ground level and to the bus stops on the busy Harrow Manorway, hence the two levels, and the need for at least half a dozen big lifts. The lifts aren't yet in operation. They soon will be. The upper concourse is the size of six tennis courts, and divided in two by a broad gateline capable of coping with Crossrail flows. Toilets will be provided near the top of the Crossrail stairs, although they're currently smothered with workforce and not yet open. One particularly retro feature appears - an actual ticket office! - but as yet there's no sign of anywhere selling coffees, Double Deckers or the Daily Mail. A pair of automatic doors lead out through the glass wall to an extensive piazza. Local commuters will be pleased to hear that a pair of Metro bins are already positioned outside. National Rail's double arrow logo appears centrally above the entrance, along with a somewhat understated station nameplate, and will presumably be joined by a similarly large purple roundel at the end of next year. The external forecourt is flat with occasional raised barriers, hence the need for a "No rollerblading, skateboarding or cycling" sign to snuff out any wilful fun. Meanwhile work is (still) not quite complete to repurpose the roadway, hence a lot of temporary barriers remain and connections to local buses remain poor. But this should soon be a seamless interchange for passengers hoping to reach Thamesmead or Bexleyheath, and a gamechanger for local connectivity. So far only one of the giant staircases down to ground level is open, and even that clearly requires a few finishing touches. I wonder how many passengers will prefer to take the lifts - these prominently displayed in two glass-clad towers - but still closed off while installation continues. Indeed there's still a heck of a lot of last-minute hi-vis work going on outside, particularly on the flank towards Sainsbury's, only after which will the full scale of the transformation become clear. It's also not yet apparent how this improved transport hub with its ground floor retail opportunities will reshape the local economy. Abbey Wood's lowly shopping parade looks like a spaceship's landed next to it, and suddenly has a direct pedestrian connection to the future. Will the regulars at the Abbey Arms at the foot of the staircase be joined by fresh drinking partners, or might a tower of flats be thought a better use of land? Another key change which took place yesterday is that TfL took over management of the station from Southeastern, despite the fact that only Southeastern trains will stop here for the next thirteen months, and all the station staff were transferred across too. Amazingly this is TfL's first ever station in the London Borough of Bexley (even if the majority of the platforms are actually in Greenwich). It also means that TfL just opened a station with a ticket office, which isn't something they'd necessarily like to crow about. As yet only the two Southeastern platforms are open, while work continues on the Crossrail island platform alongside. 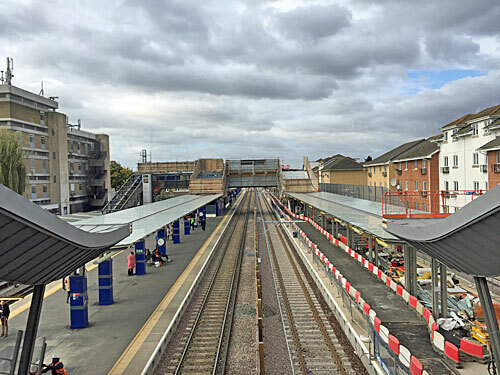 Two streamlined footbridges are in place, which along with the ticket hall stairs will allow transfer at either end of the platforms or in the middle. 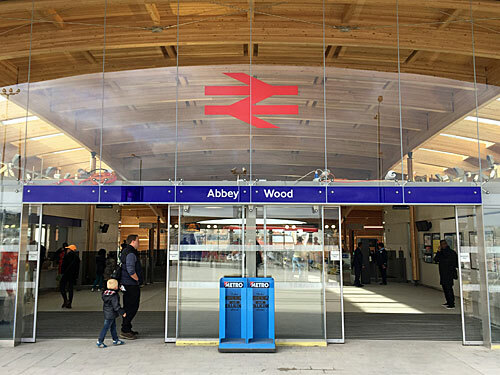 Around half of all the passengers alighting at Abbey Wood are expected to be changing trains, but if you do ever arrive by Crossrail be sure to sit up the front, otherwise it's going to be a long trek out. Unless you live nearby, or like walking round woods and medieval ruins, there's probably not much need to visit Abbey Wood any time soon. I've been and taken several photographs so you don't have to go. But in just over a year's time there'll be several trains an hour heading out from the West End to this long-overlooked location, so it's good to know the station's already ready. 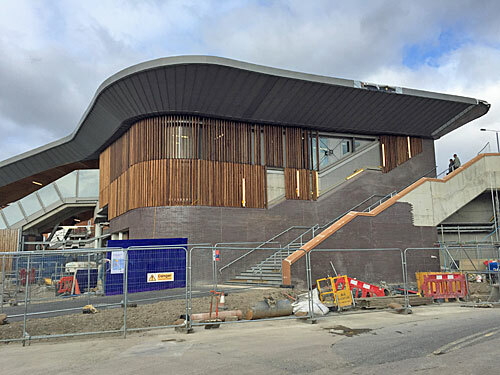 » For a beyond-comprehensive look at how Abbey Wood station has been transformed, with innumerable in-progress photos, check out the Bexley is Bonkers blog. Here, for example, are 76 photos from three years ago when the work began, and here are 50 photos from Southeastern's final day on Saturday. » Meanwhile Geoff's been along today, and here's his video. The winning number in last night's lottery was 649058. Were you a £25000 winner? That's the Barking and Dagenham Lottery, a brand new initiative to raise money for good causes, and the first weekly lottery undertaken by a London council. Councillor Saima Ashraf, Deputy Leader and Cabinet Member for Community Leadership and Engagement, said: "Despite ever-increasing financial pressures on local authorities, we are determined to find innovative ways to continue supporting good causes that benefit residents in Barking and Dagenham. We hope that this scheme could mean some groups receive thousands of pounds of local money." To enter you go online and select a 6-digit number, or as many 6-digit numbers as you like, then pay £1 a week for each. Then every Saturday evening a random 6-digit number is selected and if you match it you win £25000. There are also several smaller prizes for matching digits at the beginning or the end of the chosen number. A key selling point is that you get to choose which local good cause gets your donation. You could pick the Chadwell Heath Community Centre. or Nia Huggett Women's Centre, or Wellgate Community Farm or the 18th Dagenham Girl Guides... or you could nominate your money to Barking and Dagenham's central charity pot. You don't have to be resident in the borough to take part. A brilliant fund-raising idea, or a desperate grab for cash? Let's see. Issue 1: You're very unlikely to win. Here's the prize structure, as it appears in the B&D lottery FAQ. According to the FAQ, your chances of winning a prize are 1 in 55, or roughly once a year if you play once a week. But your chance of winning a cash prize is only 1 in 500, or roughly once a decade if you play once a week. That's because most of the 'prizes' handed out are 3 free tickets for a forthcoming draw, which almost certainly aren't going to win a cash prize either. If you keep reinvesting those free tickets in future draws the chance of a cash prize rises fractionally, to 1 in 491, but these are still really rubbish odds. As if to prove the point, nobody won a £25000 prize in Saturday's draw, nor a £2000, nor a £250. Three people won a £25 prize. Ten people won three extra tickets. Altogether the Barking & Dagenham Lottery paid out £75. This is not a brilliant way to get rich. Issue 2: It's a bit complicated to understand. Matching the drawn number to win £25000 is easy to understand, but the remaining prizes are less so because position matters. For example, if the winning number is 123456 then you'd win £2000 for 123459, £250 for 993456, £25 for 123999 and '3 extra tickets' for 999956. But there are no prizes for 654321, 912345, 923459 or 456999. It's not cripplingly difficult, but enough to confuse a significant proportion of the population... although that might still not put them off, particularly if their eyes are fixed on the jackpot prize. Issue 3: It's an Australian lottery in disguise. Barking & Dagenham council don't draw the winning number themselves, and neither do their contractors, Gatherwell. Instead the six-digit winner comes from the Australian National Lottery's Super 66 game, a weekly draw which operates using identical rules. This provides the B&D Lottery result with independent validity, although residents of Chadwell Heath may not be chuffed to discover that the winning number originates Down Under. It also looks mighty dubious that Barking & Dagenham reveal the winning number each Saturday at 8pm, whereas it was actually drawn at 7.30pm AEST, over ten hours earlier. But all's well because the B&D Lottery has a cut-off point of 23:59 on Friday, so players entering the draw on Saturday aren't eligible to win a prize until the following week. Issue 4: People don't seem to be very interested. The B&D Lottery's Twitter account has only 17 followers, one of which is the council itself, so local residents don't appear to be very enthused. Confirmation of this comes from the fact that only 587 tickets were sold in time for Saturday's inaugural draw, which is a measly total. Indeed Barking & Dagenham has a population of just over 200,000 people - about the same as York or Gateshead - and 587 tickets equates to a mere 0.3% of the population. But never fear, because the council weren't expecting their lottery to be an enormous hit. They've set themselves a target of 735 tickets, just 735, and they've nearly hit that in week 1. That said, tickets for the first draw have been on sale since mid-September, so if 587 is the best they can do over a lengthy launch period, getting additional players to sign up might be a real struggle. It's also important to remember that, unlike in the National Lottery, ticket sales don't affect the odds of winning a prize. The council have taken out insurance to pay the larger prizes, so even if they only sell 500 tickets a £25000 win would still be paid out. The insurers are probably laughing, however, because with these low sales a £25000 win should only happen once in every 32 years. Issue 5: It isn't raising much money. A major selling point of the B&D Lottery is that 80% of all cash taken goes to prizes and good causes - the National Lottery manages only 78%. Here's how each £1 raised breaks down. 50p from every £1 goes to the good cause of your choice and 10p to the B&D charity pot, while 20p notionally goes on prizes, if there are any. As for the 20% on "admin and VAT", a bit of digging reveals that VAT on lottery sales is charged at 12%, which means the administrators (Gatherwell) are taking 8p a ticket. Because we know how many tickets were sold in the lottery's first week, we can calculate how much money has gone where so far. Thus far the lottery has raised £352 in funding for good causes which wouldn't otherwise have been received. Shared out between the 20 or so charities currently in the B&D basket equates to £17 each, assuming everybody gets the same. Peanuts? Or potentially £18000 a year, all told, if this works out. Normally, if you want to donate £1 to the Dagenham & Redbridge FC Community Trust, they receive £1. They might even get a bit more if you sprinkled a bit of Gift Aid on top. In this case, however, you donate £1 and they get 50p, while 40p basically disappears, in the vain hope you might win a life-changing amount of money... which you won't. Wouldn't it be better to establish a system for donating direct, and promote that, rather than dressing everything up in a lottery and sharing less. Or do we as punters only respond to the possibility of a big cash prize, and would never have considered giving the money in the first place otherwise? Might the B&D Lottery work better if rebranded as "donating to charity with the chance to win a prize", rather than "the chance to win a prize while donating to charity"? The Barking and Dagenham Lottery might grow to success, or it might be an insignificant well-meaning failure. But the key question surely has to be why council funding has slumped so low that a lottery looks like a good way to make a difference. When you can't raise taxes to fund the needy, shake your balls.